Tucked away in the heart of downtown Zeeland, a quaint, hometown-USA community, you will find our local printer. Zeeland Print has been operating out of this community for generations, with the family passing down the trade to the next son, daughter or grandson. When you walk in, you’re hit with the smell of ink and the whirring sounds of printers spitting out jobs. 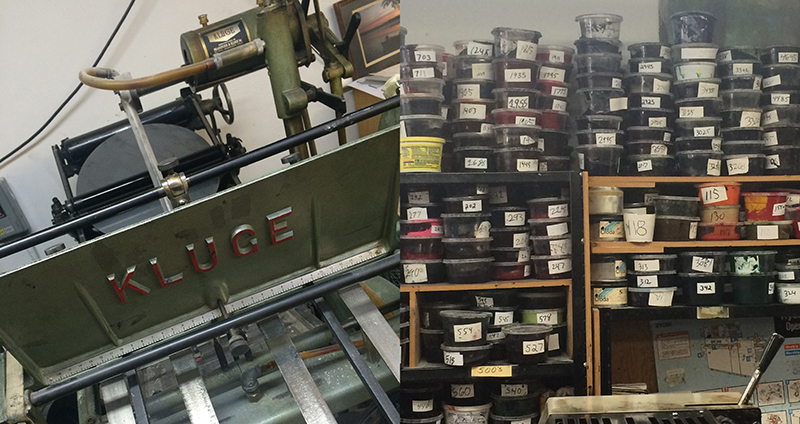 With antique letterpresses, authentic German 4-color presses, top-of-the-line digital printers, folding and binding machines, di-cutters and everything in between. They continue to grow and diversify, seeking out jobs that most larger companies refuse as they can provide a wide range of offerings to smaller businesses. They are the kind of place that makes you feel like history is alive, that you’ve stepped into a simpler time when the skilled trades thrived and everyone in town knew your name. That’s why, despite it being a bit of a drive outside of Grand Rapids, we keep coming here. They have a family atmosphere, always listening to the intricacies of the products we hope to create, and then are deeply dedicated to exceptional results. Face to face interaction and phone calls reign supreme. 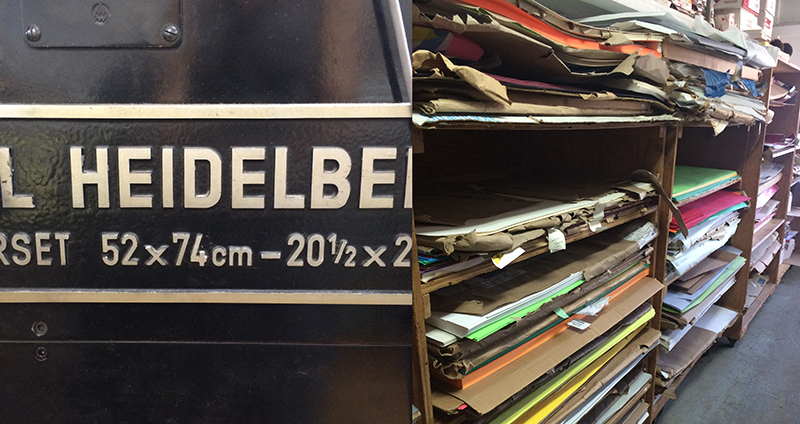 Our team had the privilege of going on an after hours field trip to meet the owner, Brian Van Hoven, learn about his grandfather’s (known as Abe the Printer) beginnings in 1919, and just how they’ve manage to adapt their business over 96 years. We were in awe of the complexities of this work. Brian answered our array of questions with a smile and we left more intrigued than ever about this segment of the industry. Again, it was like visiting family. Also, if you happen to visit our marvelous printer, cross the street and stop into the TripelRoot for some local beer, flatbreads, and the best spent grain chocolate chip cookies you’ve ever tasted (seriously, we ordered like 6 rounds after our tour, and then a few more to take home!). Mondays from here on out have been upgraded to “Midwest Mondays.” Here you will find awesome stationery shops, creative companies thriving in the midwest, local brews, well-designed spaces, and events that should not be missed. Also, every 3rd Monday we will feature a Day Date in the Midwest, giving you ideas for a mini-adventure, exploring a new town. You will agree, Midwest is Best. 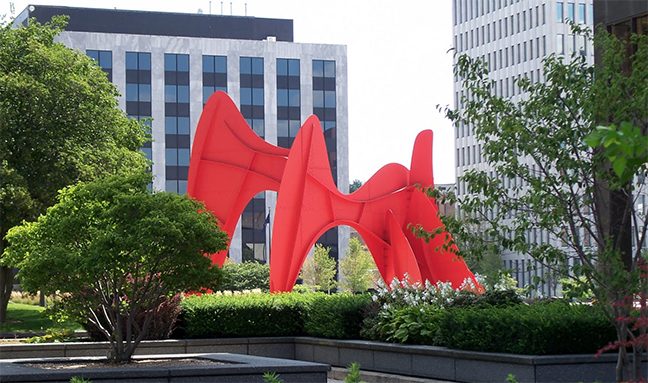 Alexander Calder’s La Grande Vitesse helped revitalize Grand Rapids’ ailing downtown. It was the initial project of the NEA’s public art initiative that awarded $15 million to help create almost 700 works. 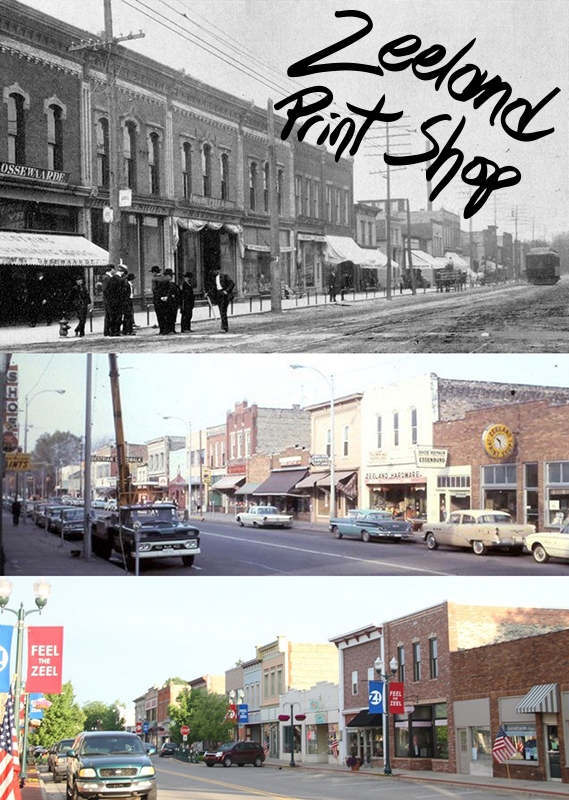 The image on the right is our shop along Monroe Center, which has historically been the shopping district for downtown. 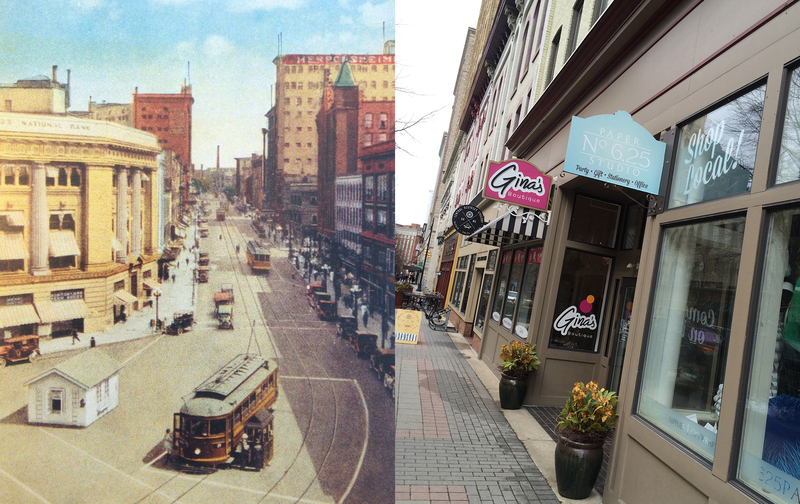 On the left you can see, looking West down Monroe Center, the history of shopping in our special area of Grand Rapids. We often think of our city as a mid-size city with a small town feel, it seems you always bump into someone you know while you are out and about. Overall, its people are helpful and friendly. The city is easy to get around with great public transportation, home to nationally ranked hospitals, and you can be home from a hockey game or a play downtown in 15 minutes. We are also the hometown of President Gerald R. Ford, so his presidential library and museum are here, which is worth a visit for history buffs as well as anyone who wants a flash-back to the 70’s. 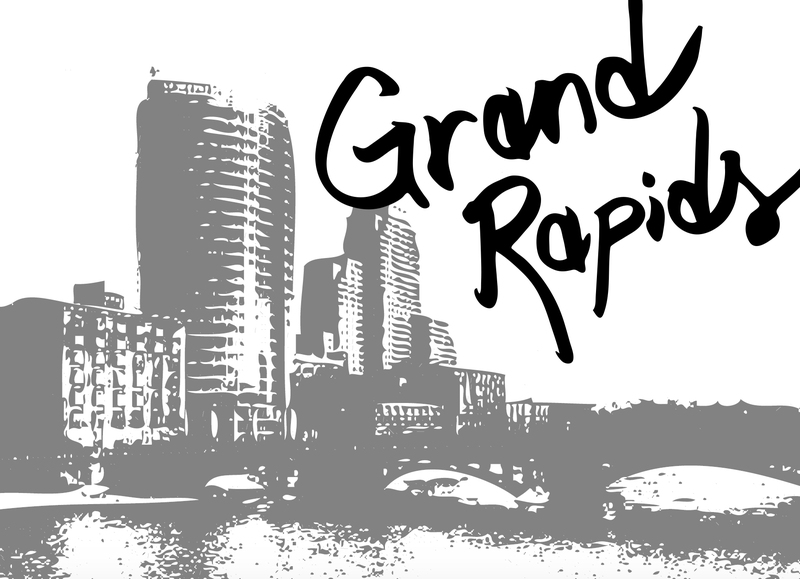 Grand Rapids has gardens, museums, a tree-canopied zoo, markets, concert venues and plenty of cultural festivals and events. Our city, built around the conveniences of the Grand River. Photo source, mlive (click on photo for source). Hands down, we love it here. Come visit us soon!